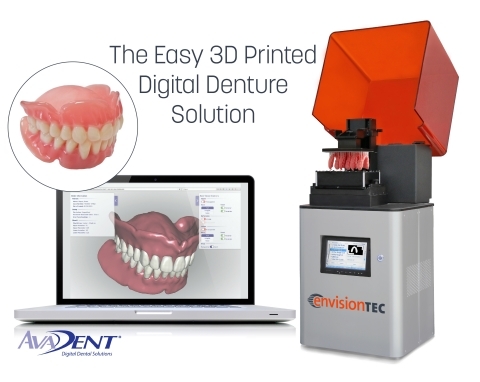 EnvisionTEC, the global leader in dental 3D printers and materials, and AvaDent Digital Dental Solutions, the global leader in digital dentures, announced a new partnership. Working together, the two companies now offer a complete digital workflow solution for digital dentures, from impressions and digital design to try-in and final restoration. A provider of high-accuracy dental 3D printers since 2008, EnvisionTEC launched the first FDA-approved full denture solution for 3D printing in 2017. AvaDent, meanwhile, offers easy-to-use digital denture software and design services to dental professionals, so prosthetics can be quickly manufactured through milling or 3D printing, with more than 100,000 dentures created. “While 3D printing a full denture on our 3D printers is easy, digitally designing a denture can be complicated. That’s why we’re so excited to work with AvaDent, which offers easy-to-use software and delivers a tested workflow to labs and dentists,” said EnvisionTEC CEO Al Siblani. “We see an immediate opportunity for labs and clinicians to begin 3D printing try-in dentures and final restorations, alongside the many other dental applications offered by 3D printers,” added Jan Slor, VP and General Manager of Global Dental Science LLC, which owns AvaDent. EnvisionTEC’s FDA-approved E-Denture pink base material and E-Dent 100 and 400 materials that simulate teeth in a variety of shades means laboratories and dentists can now 3D print lifelike dentures with a custom, digital fit directly in their office. When used on a versatile EnvisionTEC Vida desktop 3D printer, dentists can also directly print crowns, bridges, bite splints, gingiva masks and castables. AvaDent offers a suite of digital denture services including base plates, bonded dentures, monolithic dentures, hybrid dentures, overdentures, pucks and print files. Customers can scan impressions and send the scan files to the company, which designs a digital denture with proprietary Computer Aided Engineering technology and sends the design file to the customer. Dentists and labs can do the manufacturing of the prosthesis on their own mills or 3D printers — or outsource that work to AvaDent.